Really scary haunted houses are popular around Reno and Sparks during Halloween season. Some of these haunted houses have effects that can be frightening even for those who think they are ready. Parents are cautioned to use discretion when taking children to these Halloween events. Halloween 2017 is on Tuesday, October 31. Opens Thursday, October 4, 2018. The Slaughter House claims to be northern Nevada's largest haunted house. This is a professional haunted house that is reportedly really scary. You should read the Reno Fright Fest Warning before going to this haunted event. The Slaughter House is inside Greater Nevada Field, 250 Evans Avenue near downtown Reno. Haunting is in the catacombs beneath the ballpark and there is free parking across from the stadium. There is a new attraction for 2018 - the Terror Train. Slaughter House is open Thursdays through Sundays during October. For Halloween, it will also be open on Tuesday and Wednesday, October 30 and 31, 2018. October 2018 hours are 7 p.m. to 11 p.m. Thursday through Saturday, Sundays 5 p.m. to 9 p.m. The Tuesday before Halloween is 7 p.m. to 11 p.m., as is Halloween Wednesday. General admission tickets are $17. If you just can't wait to be scared, get a Speed Pass ticket for $24. The Terror Train is $10. The Combo Ticket (Speed Pass plus Train) is $30. Tickets are available online. Opens Thursday, October 4, 2018. Corn Creepers is the only haunted attraction in a real corn field. It's pretty scary and not recommended for small children. However, there is a an option where visitors can wear a glow necklace and the spooks will tone down the scary. Admission is $12 per person. If you want to do the Corn Maze as well, a combo ticket is $17. Corn Creepers is open Thursdays through Saturdays in October. Hours are 8 p.m. to 10 p.m. Located at 8100 Pyramid Way in Sparks. (775) 530-8032. Kingdom of Horrors is billed as Reno's scariest haunted house, so be forewarned. The haunting is based on the story of spooky stuff that went on at a Kilburn Estate deep in some swamp (see the website for the story), like people disappearing and having their souls stolen. 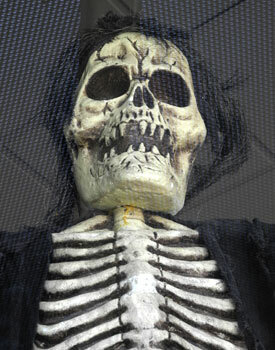 Kingdom of Horrors is located at 515 E. 7th Street in Reno, next to Roller Kingdom. Open on Fridays and Saturdays during October, 2018, plus extra days at Halloween time. Here are the dates - October 5, 6, 12, 13, 19, 20, 25, 26, 27 and Halloween Wednesday on the 31st. Hours on all days are 7 p.m. to 11 p.m. Admission is $15. There is a $2 discount if you donate a can of food. (775) 329-3472. Escape rooms are a different take on the haunted house idea. There are several available, but the two most suited to Halloween are "Dr. Ensaine" and "Virginia City Haunt." Get together with a group of friends, family, or co-workers to see if you can escape in time. Tickets are $24 per person for an hour to figure out how to escape. Located at the Outlets at Legends, 1420 Scheels Drive, Suite E-108 and 1180 Scheels Drive, Suite B-103. (775) 683-9900. Saturday, October 20, 2018 for the Halloween time ghost walks. "Madame Curry & the Vampire Hunters" tours will depart between 10 a.m. and 2:30 p.m. The tours are a spooky and enjoyable way to experience Carson City's Victorian Era and diverse past. Hear about lingering spirits of the past, haunted and paranormal stories. These are guided walking tours of the downtown district's historic homes. Tours depart from The McFadden Plaza located behind the St. Charles Hotel (The Fox Brew Pub) on Curry St. in Carson City. Tours depart every 1/2 hour and last about 2 hours. Tickets are $15 in advance, $20 day of, kids under 3 free. Tours happen rain or shine. Call (775) 348-6279 to order tickets or get them online. Friday and Saturday, October 26 - 27, 2018. Take a walk through one of America's most haunted cities. There will be two tours per evening, starting at 6 p.m. and 8 p.m. Tickets are $20 per person, cash only. Paranormal investigation will be offered at 8 p.m. Reservations required. Call (775) 815-1050 or make reservations online. Note: Anyone who is intoxicated or acting inappropriately will be asked to leave the tour or investigation and no refund will be given.